The daemon prince shrieked as it plummeted from the sky. In the ground ahead a vast warhost of chaos had materialized. On the targeting screen of his manticore McKenzie watched the daemon land in front of him an mockingly laugh off an entire platoons worth of fire. It was the creatures eyes the McKenzie was intent on and in the back of his mind a voice whispered. "be one with us and live"
Without his permission McKenzies hands plotted a new trajectory for his lethal pay load of missiles, and as his mind finally gave in to the dark whisperings he flipped the fire ignition. Col. Soulban watched helplessly as the manticore pivoted. He called out his orders in vain as the missiles fired and in an instance that lasted an eternity, Soulban watched as his entire platoon disintegrated into fine black ash. He watched as the proximity of the blast flipped the firing manticore into the air the remnants of it's crew pulping upon impact. 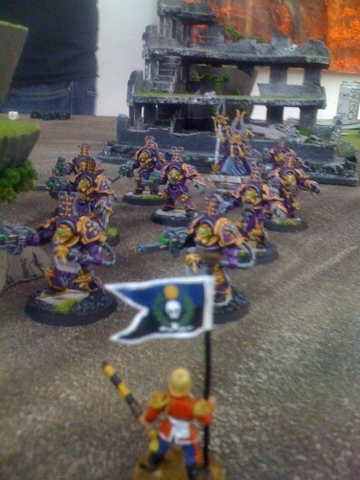 Taking the company banner in his hands Soulban bellowed a challenge and charged a group of advancing terminators. His attacks rattled off their ancient armor and the counterblow knocked the old man from his feet and cut down his command squad. As consciousness abandoned the Colonel he was vaguely aware of a massive clawed hand picking him up and then blackness. the hoard bears down on the platoon. 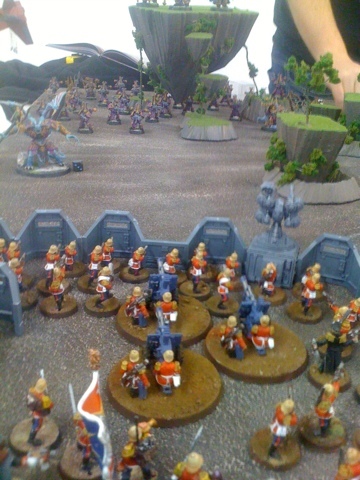 moments later they would be turned to ash as the Daemon Prince took control of the mind of the manticore pilot. NOOO! Why do Manticores do that! Another cool battle write up. A very nice looking game too! red vs purple looks great on the battlefield. and terrain wow- really cool. Will Col. Soulban get rescued or is this the end for him!? That's a typo by the way... sorry - great stuff! Will Col. Soulban be rescued indeed. there's only one way to find out! I will have to organize a rescue party!